We’re extremely pleased to announce that the first wave of synthetic assets, or Synths, is now live on Mainnet. Synths are tokens that track the price of major currencies (often referred to as ‘stablecoins’), commodities, or indices. This wave includes sEUR (tracking the Euro), sAUD (Australian Dollar), sJPY (Japanese Yen), sKRW (Korean Won), and sXAU (an ounce of gold). They join sUSD (U.S. Dollar), which has been live since June as nUSD. The launch of Synths represents a major milestone for the Synthetix Network, enabling users to hold an asset without worrying about such limitations like custody or liquidity. 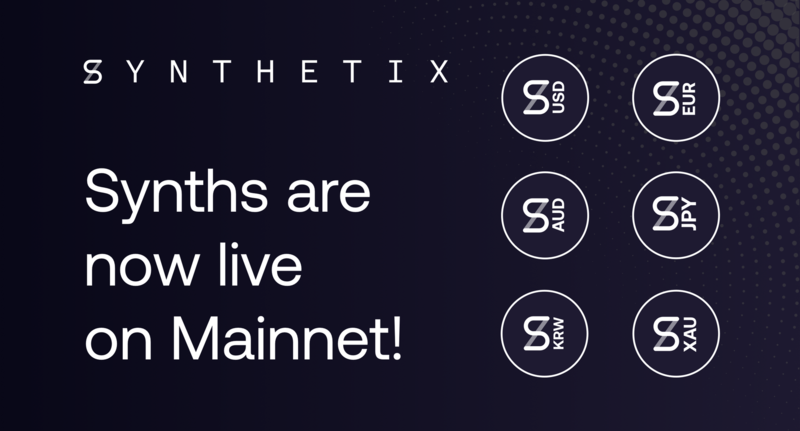 Additionally, since Synths are backed by The Synthetix Network Token (SNX), which operates as collateral, they are also trustless, censorship resistant, and transparent. You can read a detailed overview of how Synthetix works here. As has already been announced, this launch includes Open Minting and some changes to the fee mechanism, which you can read more about here. Additional flavours of Synths will be released in the upcoming months. We partnered with Sigma Prime and Iosiro, two security audit teams, to ensure the Synthetix platform does not contain any security vulnerabilities, we will be publishing these audits soon. Both audits revealed no vulnerabilities, even on the first round of testing, something we are extremely proud of as a team. Especially considering this is one of the most complex smart contract suites on Ethereum, with over 30 contracts in the Synthetix network. Minting will primarily be carried out through our Mintr dApp, which will initially only support sUSD. Mintr is currently down for maintenance following the deployment to Mainnet but will be up shortly. During this time you can use the ABI interface to mint Synths or swap between them. When users mint Synths through Mintr, they will be given the option of sending them directly to the Depot sale queue on Swappr, and will receive the proceeds of that sale when their minted Synths are sold. Before Christmas, we will be launching a platform called Synthetix.Exchange, which will allow users to easily swap between different Synths. For example, someone holding 100 sUSD might wish to diversify into Euros as well. They could jump onto Synthetix.Exchange and convert half of their sUSD into sEUR. Thank you to everyone who helped us reach this major milestone, including our major backers, our community Guardians, and everyone in our Discord server who contributes to making it such a hub of productive discussion.